Have you ever asked yourself (or has someone ever asked you): Why cassette tapes exist nowadays? What’s the sense of publishing or buying a tape when we can choose digital download or the even cheaper streaming on the web? This is a pretty interesting question and I’m not going to argue about it but I can give an example that might help someone to understand why the cassette is still a cool thing to own and to listen to. The example for today is Cabin Floor Esoterica. Being a Bear Bones, Lay Low and a Gnod fan, I’ve been following the work of this label since a while. 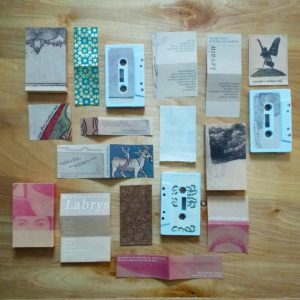 As you can hear from this interview, Jordan Spencer, the guy behind the label, naturally started releasing tapes in 2009 without any specific long term idea, tempted by the good weird tape scene in Ohio. After some years he created an interesting catalog ranging from psychedelia and improvisation to avant folk sounds. Each release (mostly tapes, some 7” and some art zines) comes with hand-assembled packaging, additional texts and other little objects like dried leaves, old postcards and other artefacts. We have three new releases dropped from the label in October 28th. The first one, the 60th of the label, is “Labrys” by Asheville’s nylon string guitarist Shane Parish & Chicago’s percussionist Frank Rosaly. The sonic field is the one of the free folk improvisation: while the guitar travels between melodic arpeggios with a primitivist approach that reminds me to the works of Maurizio Abate in almost the whole album, the drums and percussions cover a big range of sound, from educate noises to destructured freakness. The two musicians are also active in some other sweet projects worth checking out: Parish has recently released a duo LP with Tashi Dorji on MIE and has an upcoming album for Tzadik, Rosaly is the drummer of Health&Beauty and collaborates with Ingebrigt Håker Flaten & Dave Rempis. The second tape is “Sax Worker’s Rights” by Saint-Petersburg’s Ilia Belorukov and Helsinki’s Taneli Viitahuhta. This tape is all about experimentations with (prepared?) saxophones but it’s far from being a virtuoso sax solo album, the sounds come out slowly creating a superb intimacy, the harmonics from the instruments slowly move on space, get into your brain and they hardly escape. The first track “Sax work is Work” is a discontinous sax drone with moments of silence and it reminds me of “Drinking and Hooting Machine” by John White, more popping and weird sounds appear on “health & Security” and the second side of the tape get crazier and super virtuoso without being too pretentious. This one is surely my favourite from the batch. 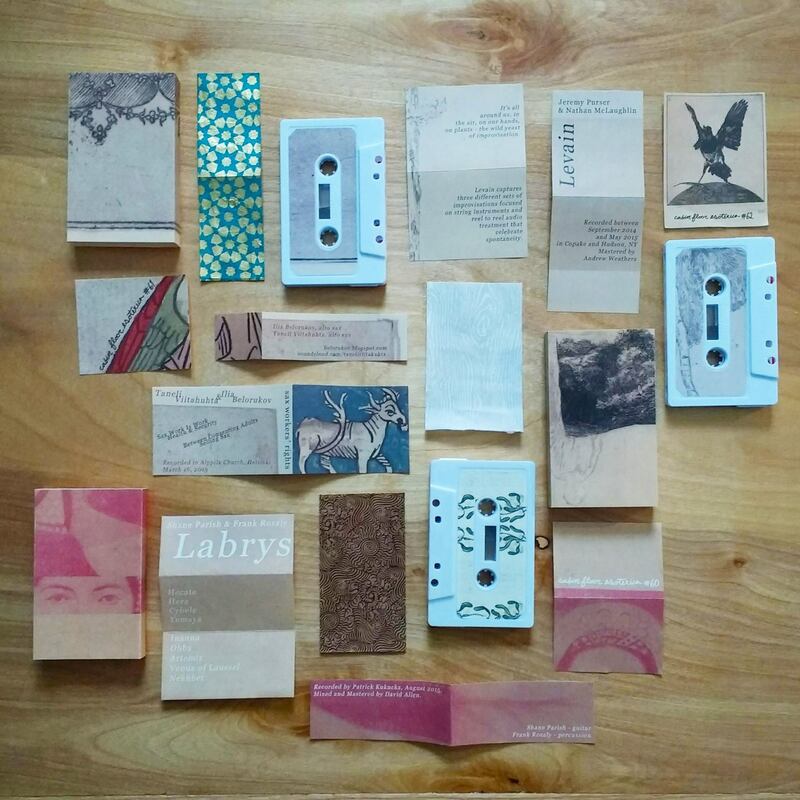 The last tape from the batch is “Levain” by Nathan McLaughlin & Jeremy Purser. This time we are floating into shoegazing guitar drones, hiss and resonating and acid americana arpeggios, some snippets recall the work of other guitar drone acts like Lost Trail or Thisquietarmy. The whole work is less homogeneous than the other two tapes previously described but it’s completely in line with the cabin fooor esoterica style. The cassettes are still available physically (each in an edition of 75) and digitally since Friday October 28th through the website and the bandcamp page.